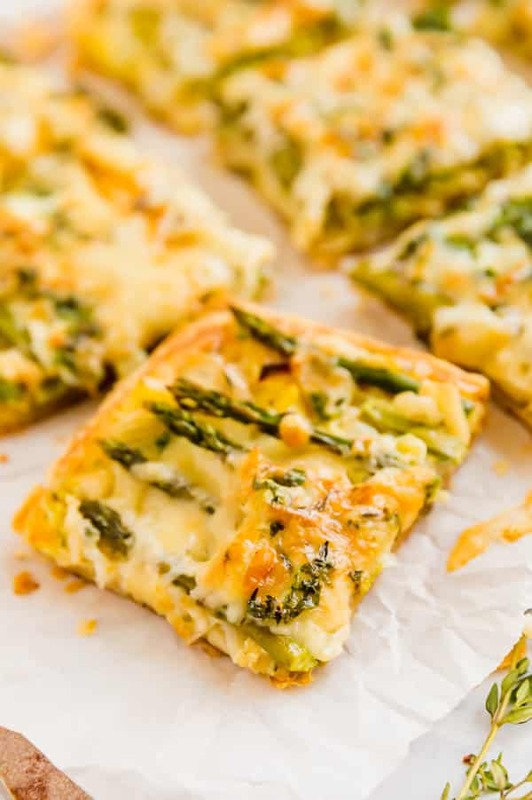 This Asparagus, Leek and Egg Tart is a quick and easy brunch option that is full of great flavor! A while back I had to make a savory brunch option to bring to a mother’s day celebration. In an effort to use what already I had on, I made this asparagus tart. I added some sauteed leeks and Gruyere cheese as well as some fresh herbs from my garden. 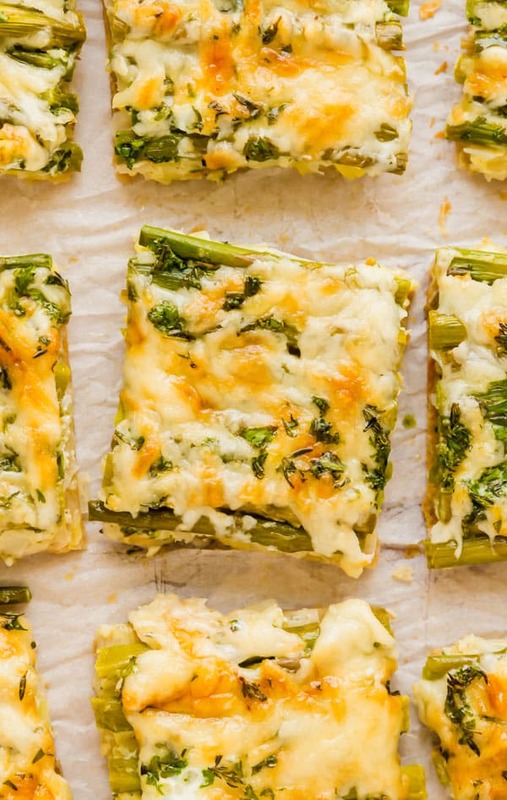 Nothing makes me think of spring the way things like leeks and asparagus do. Freezer puff pastry makes this whole operation much easier while also providing a perfectly flaky, butter crust. 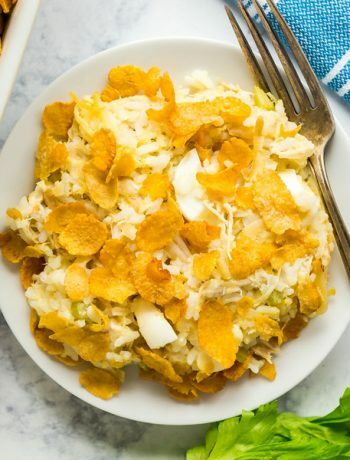 Topped off with custard-y scrambled eggs and gruyere cheese, this is a brunch or lunch option that is sure to please. Be sure to thaw the puff pastry. I place it in the refrigerator the night before. Be sure to clean your leeks well! Gently roll the dough out slightly. I do this on a silicone baking mat or parchment paper to make it easy to transfer to a sheet pan. I fold over the edges of the dough slightly to create a small crust. I dip my finger in water and use that water to adhere the crust to itself. Gently poke the inside of the dough with a fork being careful not to pierce all the way through. After the first portion of baking, use the back of the forks to gently press the middle of the dough down and “deflate it” so that the outside crust doesn’t deflate. I layer everything onto the crust. 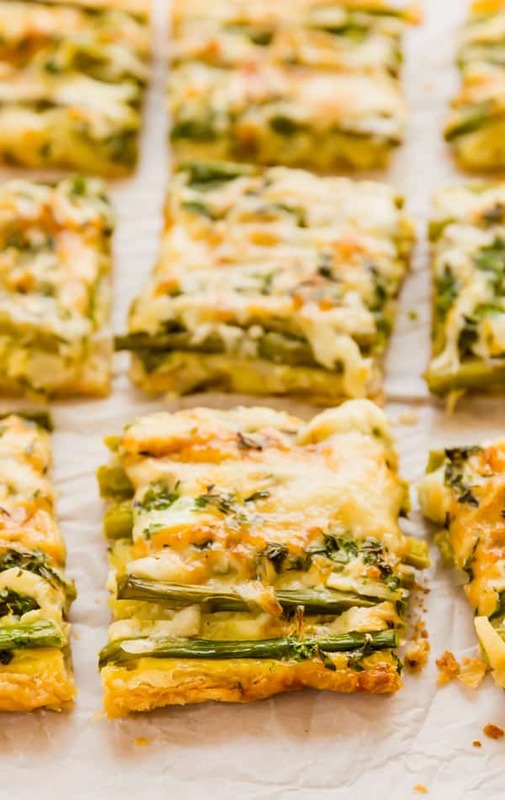 Leeks first, then line up the asparagus, top with cheese and pour on the egg mixture before finishing the baking. Go slow when pouring the egg mixture and if it springs a leak, don’t worry if you spring a leak. Once the tart is cooked, you’ll just cut off the excess egg and it’ll look perfect. How to trim asparagus? Hold each spear toward the end that doesn’t have the tip on it and gently start to break the end. It will naturally break where the woody part ends. What are leeks? Leeks are cousins of onions and garlic, but they have a more mild, delicate flavor. The white base and light green part of the stalk are the parts you eat. How to cut leeks? Cut off the dark green, fibrous top parts and the roots on the bottom. Cut down the middle of the white part lengthwise. And then slice the halves into pieces. 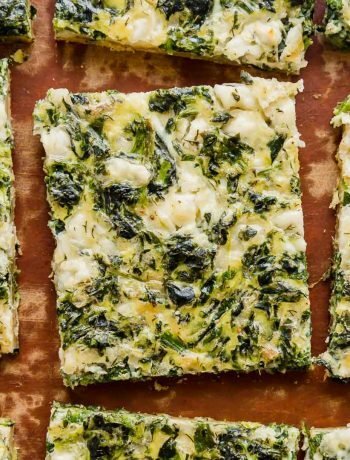 How to cook leeks? I saute these in butter with a little salt and pepper to soften them. Can this be made ahead? This is best served right away, but you can cook the leeks and par-cook the asparagus in advance. 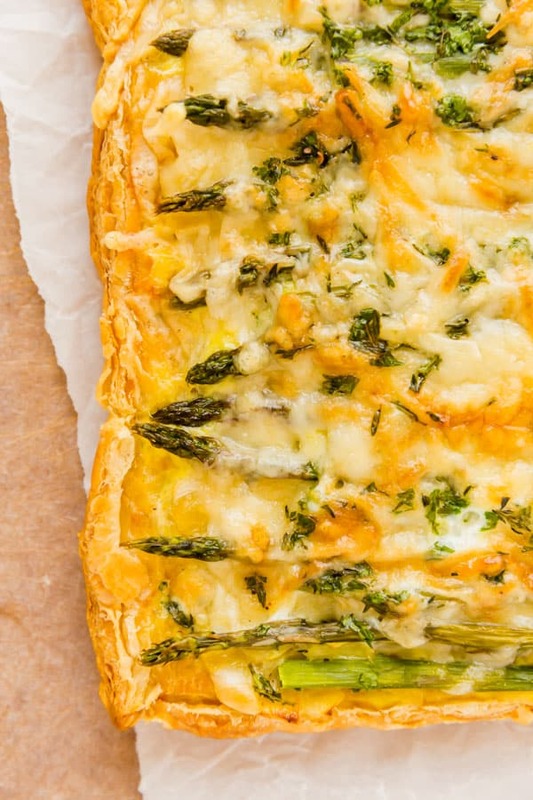 How long does this asparagus tart last? 2-3 days covered in the refrigerator. Should this be served hot or cold? It can be served either way, but I think it’s best served warm. Melt butter and olive oil together in a saute pan over medium heat. Add leeks and season to taste with salt and pepper. Saute for 10 minutes and then remove from heat and keep them to the side for later. While leeks cook, wrap asparagus in damp paper towel and microwave for 2-3 minutes to soften slightly. Set aside for later. On a silicone baking mar or piece of parchment paper, roll out puff pastry dough slightly and transfer to sheet a sheet pan. Fold the edges of the dough to create a "crust" an adhere with water. Then pierce the dough randomly all over the center so that it doesn't puff up as much in the middle. Make sure you don't cut all the way through! Bake for 10 minutes. Once the 10 minutes is up, remove the puff pastry from the oven and reduce the heat to 400 degrees. 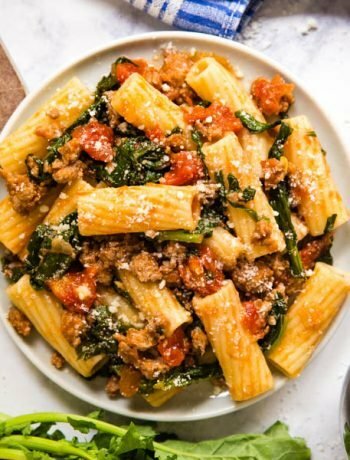 Using the back of a fork, push the air out of the center of the dough so that it flattens a bit in the center (leaving the crust around the edges high). While the dough is baking mix whisk together eggs, milk, lemon thyme, parsley, salt and pepper to taste in a mixing bowl until well combined. Set aside. 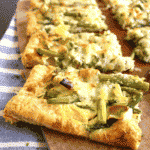 Scatter leeks all over the dough and line asparagus up across it on top of the leeks. Sprinkle with Gruyere cheese and pour egg mixture on top. Bake for another 20-25 minutes or until set. Serve once it's cooled slightly. May 26, 2015 at 4:22 pm Thank you! I really enjoyed it! May 27, 2015 at 9:27 am Thank you- I never used to eat leeks, but lately I've been loving them! May 27, 2015 at 2:05 am This looks absolutely delicious, I am not big on veggie tarts but I would have this one in a heart beat. Thanks for the recipe. May 27, 2015 at 9:25 am Thank you :) Enjoy! March 19, 2017 at 6:31 am This looks beautiful but I believe you used spring onions, which are skinny. Leeks are quite fat. Still looks very tasty though! June 12, 2018 at 6:39 pm how would you suggest making this ahead? could you assemble the tart and leave it in the fridge before baking? thanks! 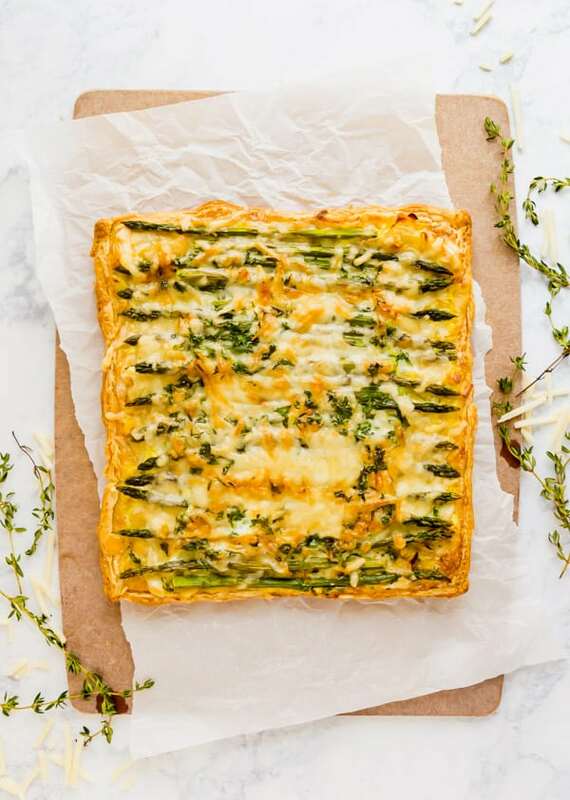 June 15, 2018 at 8:24 am I'd say do the sautéing of the leeks and blanch the asparagus ahead and maybe prepare the puff pastry and have it on the pan and in the fridge. Then assemble the day of and bake off. Let me know how it goes!